Christmas Countdown: Christmas is just 13 weeks away! I don't know why, but we never seem to have any bookmarks in our house. This is particularly odd because Jason and I are avid readers. Of all the homemade bookmark ideas I've seen and tried, this one is one of my all-time favorites. It's cheap (practically free!) and incredibly easy. I made five bookmarks in about five minutes. Cards you've received in the mail, such as Christmas cards, birthday cards, etc. I had cards from Christmas 2013 on hand. As part of my crafting stash, I had scissors and a hole punch. A few years ago, I bought a big bag of assorted ribbon on spools for $2. I've used ribbon from this bag for felt ornaments, gift tags at Christmas and other assorted projects. It was one of my best buys from a garage sale ever! My out-of-pocket cost for this project was $0. Love that! 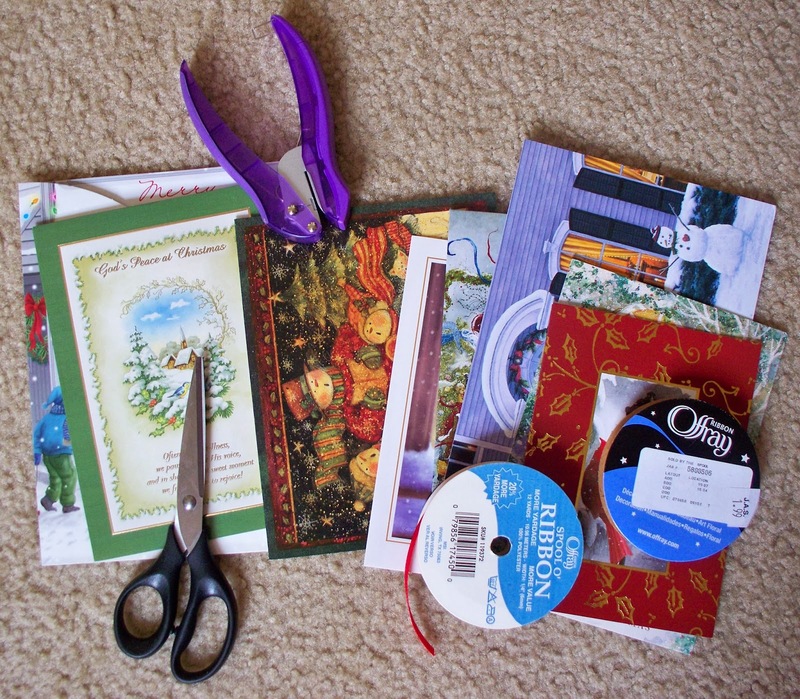 Using your scissors, cut out images from the cards. Punch a hole near the top of each card piece you've cut. Cut a piece of ribbon. Mine were about 10 inches long, but I cut extra. You could choose to cut 6 inches or so if you're wanting to conserve ribbon as much as possible. Put both ends of the ribbon through the hole and loop the ribbon back through on itself to make a knot. Cut off any extra ribbon. 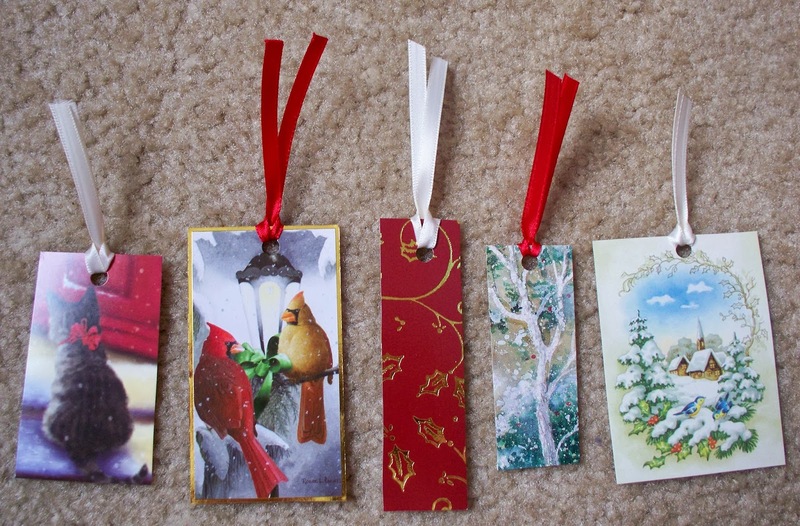 I made the 5 bookmarks pictured in about five minutes. When Jason saw them, he was totally impressed and loved them! I think we may have a small fight over who can use the kitty bookmark :) I also love this project because it recycles cards you likely would've thrown away. Now the cards you were sent can be put to another use!